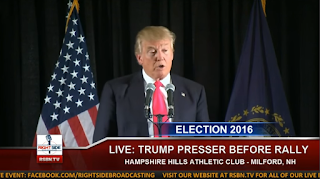 Tuesday, February 2, 2016: Just before a campaign rally in Milford, NH, Donald Trump took questions from reporters at his first press conference following a second place finish in the Iowa caucuses. Trump came out of Iowa unscathed, 7 delegates to Cruz's 8 delegates. That is a strong number for Trump's weakest polling State. Heading into New Hampshire where Trump has a 22% lead in the polls (and no poll is accurrate, could be lower, could be higher) means Trump will take an early lead, with possibly 40-50% of the 23 delegates available in NH. South Carolina Trump has a very strong lead there as well, with 50 delegates available, so it will be nice to see Trump take an even larger lead and portion of delegates there. Nevada's primary is on Feb 23rd and we all know that Trump's lead there is astronomical, that means Trump will be the leading candidate heading into Super Tuesday (March 1st). So if I were Trump I would not be sweating it at all, I would still keep the energy up at a high level and encourage the voters to show up, but Cruz winning Iowa is not a lasting victory by any means, and the future looks bright for Trump taking the nomination. Again Trump's campaign is focused on winning the candidacy, not putting all of his eggs in one basket (Iowa) like Cruz and Rubio did. I think Rubio will go down in the polls when Florida (his home state) votes strongly for Trump and that will be quite embarrassing for his campaign.